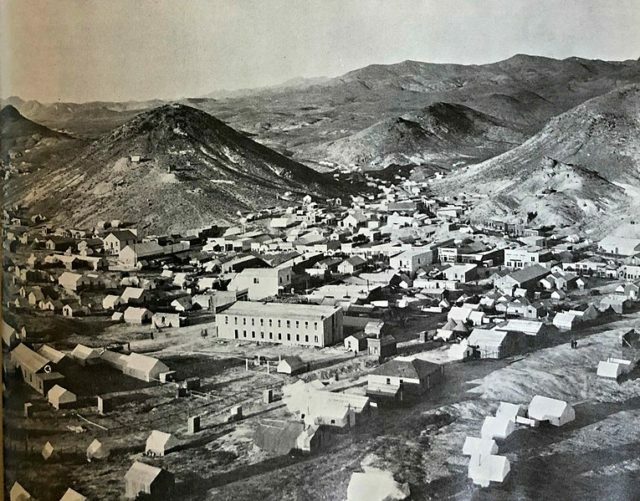 55 miles southeast of Fallon in Nevada, a mining town called Rawhide used to exist. Its history is intriguing enough to inspire even the laziest of writers into coming up with a page-turning novel. To fully grasp its story, we need to travel back to the winter of 1906, before there were burros wandering up and down the town streets or pickaxes on almost every porch. That Christmas, a miner by the name of Jim Swanson had a change of luck when he discovered rich veins of both gold and silver on a nearby hill. The news traveled fast and soon reached the ears of Charles “Charley” Holman and Charles “Scotty” McLeod. The pair gladly joined Swanson and staked their claim on what would later become known as Hooligan Hill. The three of them formed a camp and Charley came up with the name Rawhide as a jibe towards the camp of Buckskin, where he had been barred from prospecting. Swanson’s success soon reached the surrounding towns, and a rush was slowly brewing. Back then, whole towns would be formed around one gigantic mine that employed everyone. Detail from 1:250000 USGS map of Rawhide, then located in Esmeralda County, Nevada in 1910. But Rawhide was different in every way, and its popularity grew due to the merits of marketing and speculation. It was not the production of gold that made it famous, it was the promotion of it – the selling of the perfect dream. 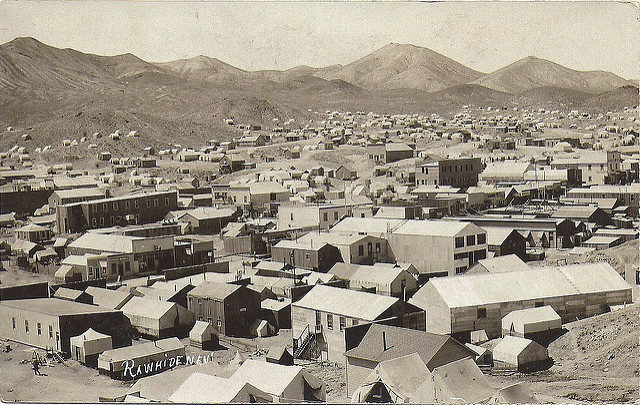 In 1907, Rawhide became an official town when its post office was opened. A number of investments followed, the largest of which was the stamp mill. With each passing day, Rawhide kept growing. A bigger population brings bigger problems, and clean water for drinking was one of them – well, finding water in the middle of nowhere is always a challenge. The problem was solved by hauling water from Dead Horse Well at a price of 50 cents per gallon. The population peaked at around 7,000 people in the spring/summer of 1908. 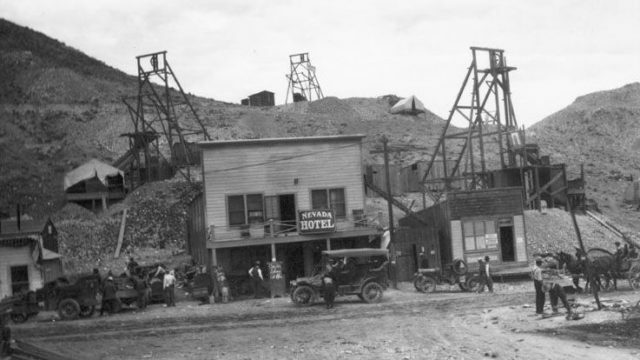 The Nevada Hotel, Office of Fidelity Securities Corporation Brokers and mines in Rawhide, c. 1910. A sign in front of the hotel reads: Car for Schurz at 11 a.m.
By 1908, Rawhide was making money rapidly. There were twelve hotels, no less than thirty-seven saloons, close to thirty restaurants, a theatre, a school, and the promise of enormous returns. The town’s population was diverse. 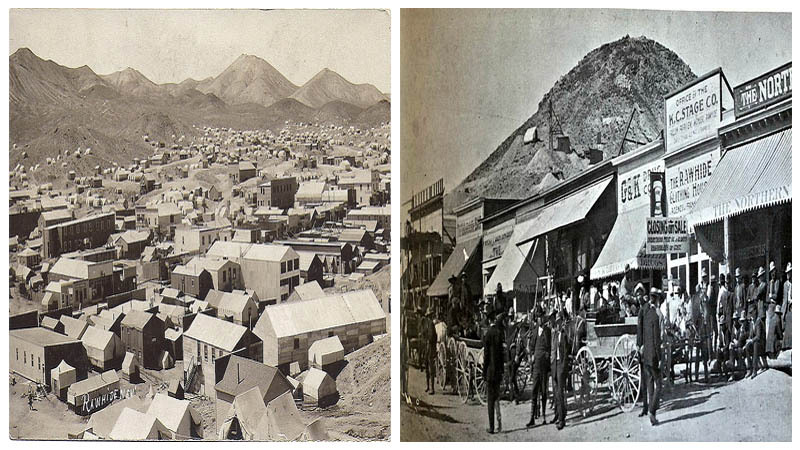 From miners and prospectors to gunslingers and gamblers, everyone enjoyed their life there. 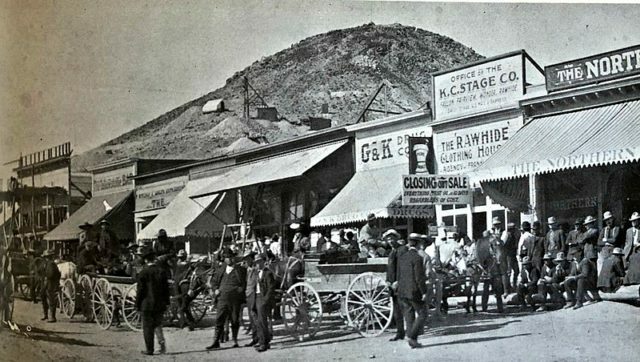 Stock promoters and big city investors were also part of Rawhide’s history. Streets of Rawhide, Nevada, 1908. All were in for a quick buck. One young man by the name of George Rice took things rather seriously. A con artist by profession, Rice best sold the dream of quick riches and promoted the “Land of Gold” as best as he could. After he had gathered enough money by selling plots of land – it is said that he managed to make $100,000 – he left Rawhide and disappeared. All was good until September 1908. A fire of mammoth proportions swept the area and destroyed a large number of businesses. From that point on, the town began its short and rather quick decline. On August 31, 1909, it was flooded by a ten-foot wall of water. 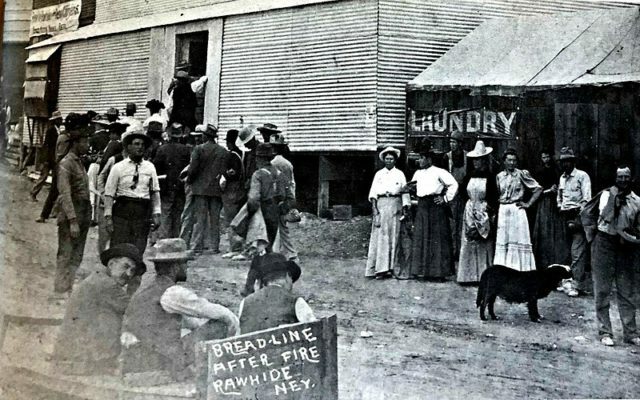 The devastating fire in Rawhide, Nevada on September 4, 1908 caused over $1 million in property damage and left thousands homeless. More than a hundred buildings were destroyed. Two years after the town was formed it was gone, though it continued to exist on the edge of abandonment for another decade. 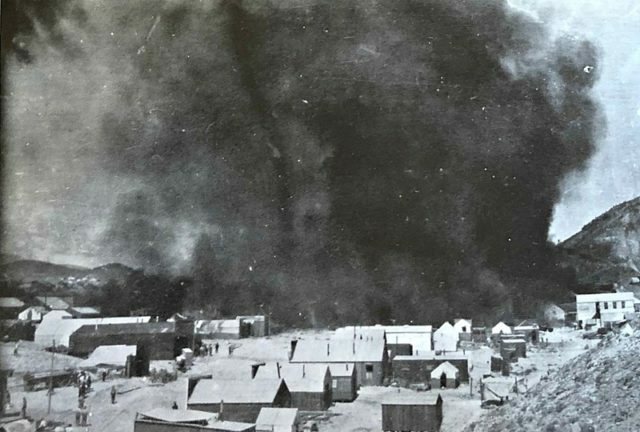 After the fire in September of 1908, the town was put under martial law. Special relief wagons were sent from Reno. By 1920, Rawhide was no more. Even though the town itself is gone, its stories have prospered throughout the years and still survive today. A nonprofit organization is working around the clock to preserve Rawhide’s legacy.